DrivenBI, provider of SRK – the only cloud-native self-service BI platform that empowers business professionals without IT’s constant support, today announced the introduction of AutoCAD connectivity to its data preparation utility tool. Adding AutoCAD integration as part of SRK allows CAD designs to connect directly to business data and instantly show how designs impact overall project costs. The idea to automate sourcing useful data from AutoCAD designs and incorporating it into business analysis came from one of the largest supermarket chain operators in Asia. The supermarket faced the challenge of version control and manual information gathering. Now, with the AutoCAD integration capability of SRK, any changes in designs are instantly available for analysis, reflecting the cost impact in real-time. With instant information access, the supermarket can better plan floor, store and display layout, to streamline shelf stocking and ultimately sell more products. It normally takes the store’s team dozens of design revisions and back-and-forth verbal communications, until different departments can finalize a floor plan. Floor managers wanted to focus on designing shelves and stock arrangements rather than doing manual, tedious calculations with spreadsheets. With SRK, they can set up the automated retrieval of shelf dimensions, price, monthly operation fees and more from the AutoCAD designs. As soon as there is a new design, the changes can be quickly extracted and incorporated into analysis to reflect the impact on the overall cost. SRK streamlines design and approval, improves accuracy of data and analysis, and most importantly, allows the team to focus on making timely and smart decisions that will drive their business. 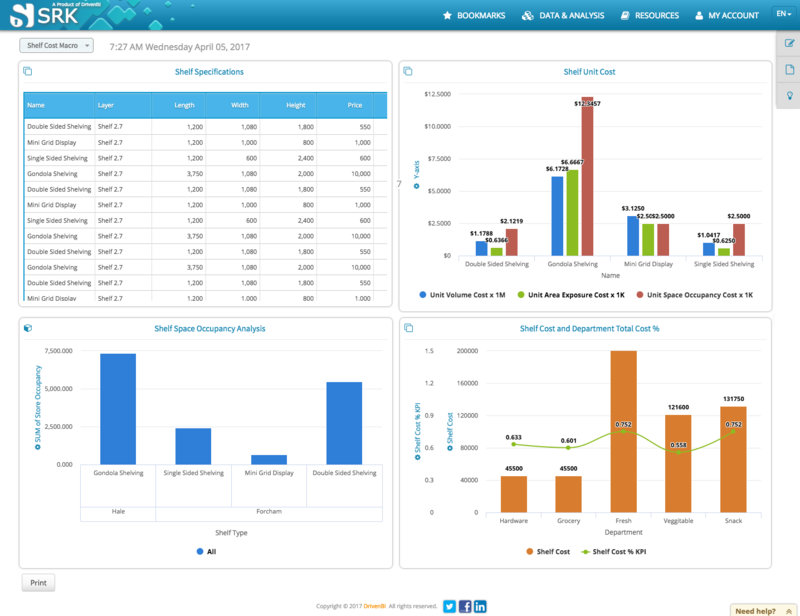 With SRK's self-service approach, headquarters can quickly and smartly customize analysis in response to any change in regulations or business without relying on IT.